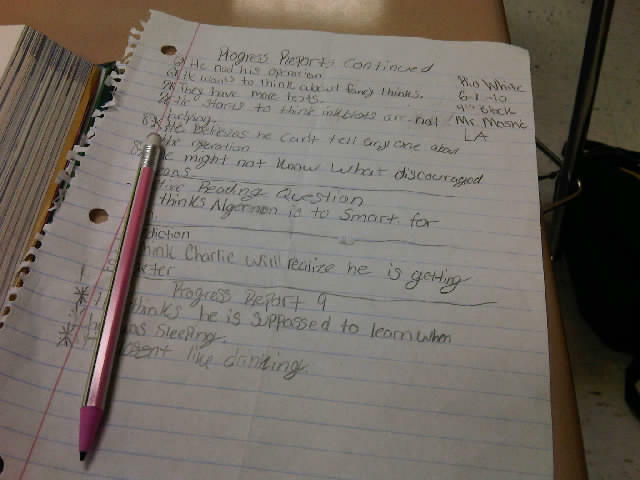 Flowers for Algernon by Daniel Keyes – 1 – Preparing | Mr. Moshé's Critically Thinking . . . Are You? Daniel Keys offers some thoughts on the story, how it came to be, and where he stands on the issues surrounding it right now on the Daniel Keyes FAQ page. You want to know something about the human brain. What do we know about the brain? Answer this question: What would happen if one were to sustain a severe injury to regions of the brain? What do you hear that you did not know? What did you hear that you did not know? With what did you agree? Provide support for your opinion. What did you disagree with? Provide support for your opinion. What if you could be part of something that could change the world? You are. Would you want to be a part of it? Very often, large research studies can be things that change the world. When a person finds out about an opportunity to be part of an experiment, that person must go through a battery of tests in order to be recommended or disqualified for the experiment. Imagine you are such a person. You have heard about a research study for which only 100 people in the country will be selected. People selected for the experiment will receive $10,000.00 for participation. You want to be selected. In order to be selected you have to take the tests listed below. What is IQ? Start with an I.Q. Test. There are lots of questions surrounding I.Q. Tests in general: What value do they really hold? What are they actually measuring? Do scientists agree on their validity? uses? IQ Test – This will take more than 45 minutes if you’re honest. Here is another link at funeducation.com – IQ test – FunEducation. This one is self-scoring. I like it. It’s a lot like the paper one I’ve used in class. Proceeded into Rorschach Tests. Basically, Rorschach Tests, also known as Inkblot Tests, are used to measure the personality and emotional characteristics of an individual. There are few versions of these online. Harrower-Erickson Multiple Choice Rorschach Test – Personality Tests – This one leads the viewer to possible limited perception choices by offering multiple choice answers that are supposed to correlate with what you “see” in the image. Take the Inkblot Test Online. Authentic Ink Blot Test Templates … – I prefer this one; it doesn’t lead the viewer with multiple choice answer options. WILL NOT WORK IN BLOCKED SCHOOL DISTRICTS. Next up, a Common Perception Quiz. Westminster offers this Perception Quiz. There aren’t multiple options for this one. This is the one I use. Then, we looked into the Stroop Effect “named after J. Ridley Stroop who discovered this strange phenomenon in the 1930s” (Neoroscience). The driving question here is what will your brain choose? colors or words? 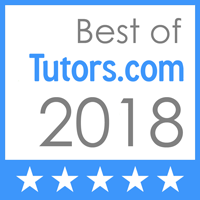 Stroop Effect – Use this link to submit results for a grade in the Google Classroom. The Thematic Apperception Test (TAT) uses a series of ambiguous pictures of people in different situations to which the viewer ascribes meaning (http://www.britannica.com/EBchecked/topic/590469/Thematic-Apperception-Test). And now, the coolest of all – ILLUSIONS. Check this out. One must crawl before one can walk. SO let’s get down to the lowest level here. Start at the beginning. In order to get this, we have to all be very clear about the difference between the subject and the theme. The subject is the general topic being dealt with . . . The theme is the position on the topic the reader/viewer gets on the topic . . .
. . . let’s say LOVE CONQUERS ALL. This is the theme. VERY IMPORTANT – IF this THEME is true ACROSS CULTURES and for all HUMANITY then, and only then, can we call it a UNIVERSAL THEME. Begin with a method for identifying theme in author’s, or artist’s, work. This UNDER 2 MINUTES video lays out a 5 step process that can help anyone uncover the theme in a piece of, well, anything, I guess. . .
From SHMOOP, I offer Themes-Part 1, a brief introduction to THEME in general… Here, brief and to the point . . . Check it. On the topic of UNIVERSAL THEMES, which for most of us is a journey of discovery, we watch, pause, and discuss themes presented in a video on DISCOVERY EDUCATION.COM. You will need your own sign in to use this amazing resource offered by the Discovery Channel. First, a video called Universal Themes in Literature. You will be taken through some of the more common overarching big ideas dealt with . . . Check it – Universal Themes in Literature. To go deeper as we bring in other disciplines, this video clip (about 6 minutes) delves into Universal Themes as they are dealt with in ART. Very insightful – Common Stories and Themes. This one, also offered on Discovery Education, I was able to find on Youtube. It is old and corny at times, but it is well worth the time. Prep your group for the rough video clips that may date back to the early seventies (hehe). Good stuff. This one will illustrate how the same Universal Theme can be carried in different works by different authors at different periods in history. Truly, Universal Themes hold true throughout history . . . Here check it out . . . This is what it’s all about. Theme! No matter what you taste, read, see, hear, live through…it all connects with a theme. One way or another, THROUGH YOU, everything can be connected to a theme. That is the KEY. YOU are the key. You have to work on the text, painting, sculpture to uncover a theme. Not just that, if it is a big deal. That is, if the THEME you uncover is a BIG DEAL, a truly BIG IDEA, then it’s VERY likely it can be described in terms of one (and likely more than one) UNIVERSAL THEME. To start, let’s take a look at some introductory clips on theme and universal theme. In this video, we are taken on a journey, with musical accompaniment, through some of the more common themes in literature. I enjoyed it, and it will definitely bring some of your more reluctant learners to the table. Watch this . . . This next one moves fast, so be ready to click the screen or pause button, if you are going to use this as an introduction to themes in art and literature. I use it in the midst of study as I attempt to capitalize on teachable moments. It’s a little tricky to catch the click moments, but it is well worth it. Here is a piece from a high school teacher – How to Find a Theme. It can be a little slow moving at times, but this isn’t an action movie after all. Full of useful information. Embedding was disabled by the user, so I can only offer the link. – How to Find a Theme. WHERE CAN WE FIND THEMES? So, let’s go back to where we started. I would like you to answer a question for me. 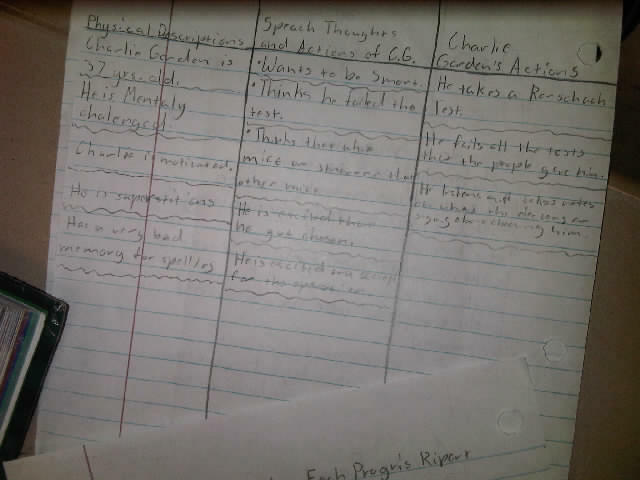 Can you argue that there is a SUBJECT presented by one of these themes? And if you can, then can you identify what you would call a THEME on that subject? And if there is a theme, then would you please explain a supportable UNIVERSAL THEME in any part of this video? Here is a CLASSIC!!! A diverse group of high school kids is sent to detention for various reasons. While in detention together, they grow closer. Brian asks if they will remain friends on Monday. This clip is from a defining film in cinematic history, The Breakfast Club. It touches on the following SUBJECTS: Cruelty, Friendship, Insult, Hypocrisy, Stereotypes, Empathy, Conceit, Popularity, Embarrassment, Candor, Identity, Image, Ego, Insensitive, Discrimination, Peer-Pressure. Pick one of these CORE SUBJECTS. Explain it in terms of THEME. What did you get out of how the SUBJECT was dealt with? Is this true across cultures? How ’bout a SPIKE LEE joint? In this clip called Humiliating The Homeless, a homeless man gets ridiculed by local teens who have no sympathy for his plight. Heads up y’all, there is a subdued S-bomb and a quick F-bomb in here. I had to include it though, it’s tight!! You really feel how young people are SO insensitive toward the reality others live. Topics dealt with in here make strong thematic connections through Homelessness, Insult, Teasing, Bullying, Sadness, Humanity, Empathy, Disrespect, Apathy, Indifference, Judging, Discrimination, Stereotypes, Insensitive, Humiliation, Poverty. Check this out . . . then lets’ talk about it. In this clip, called Insulting Del, as an argument escalates, Neal insults and humiliates Del, just for being who he is. Topics dealt with here are: Humiliation, Insult, Bickering, Insensitive, Argument, Candor, Judging, Power of Words, Cruelty, Mocking, Teasing, Self-Esteem, Shame, Hurt, Annoying. Can you talk to me about how being insensitive toward another person is dealt with? In this clip called Your Destiny from the film Back to the Future, after getting some much-needed advice from Marty, George gets the courage to approach Lorraine to ask her out. Topics dealt with include: Dating, Coward, Courage, Destiny, Romance, Embarrassment, Awkward, Advice, Carpe Diem, Nervous, Insecurity, Confidence, Self-Confidence, Fear, Risk, Anxiety. In this clip from the wondrous film Gladiator, called Remembered As Men, as the new gladiators prepare for their first spectacle, Proximo gives them a speech on dying with honor. Topics dealt with include Fighting, Spectacle, Courage, Bravery, Legacy, Death, Fearless, Fear, Machismo, Bloodlust, Speech, Coaching, Survival, Preparing, Battle, Slavery, Manhood. One theme could be summed up as stated above, DYING WITH HONOR or we should at least die with honor. How about in this video? Can you argue that there is a SUBJECT presented in this clip? And if you can, then can you identify what you would call a THEME on that subject? And if there is a theme, then would you please explain a supportable UNIVERSAL THEME in any part of this video? Oh, yeah? How ’bout this one? Can you argue that there is a SUBJECT presented in this clip? And if you can, then can you identify what you would call a THEME on that subject? And if there is a theme, then would you please explain a supportable UNIVERSAL THEME in any part of this video? We will take this broad knowledge into our study of Flowers for Algernon. Where is someone else “coming from”? If you truly understand a character, then you should be able to tell me “where they are coming from.” When you complete an assignment like this, when you act as another person/character, you are showing that you understand and can practice empathy. What truths about oneself are uncovered by the study of art, literature and others? Why is it important to understand where other people are coming from? While reading the story, you will make inferences constantly. 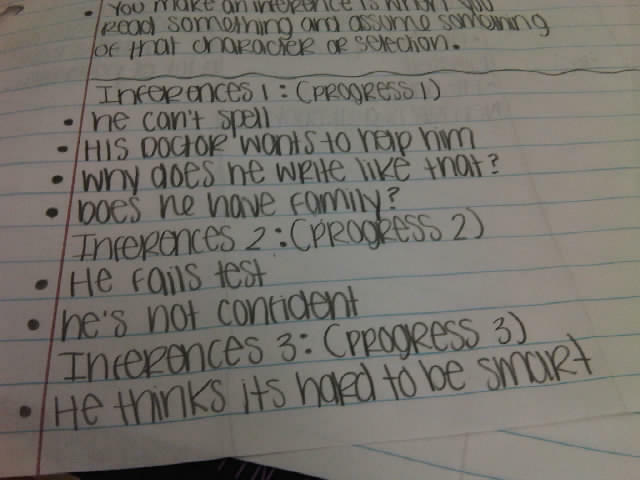 What does inference mean? What does it all add up to? What is required to make them? You will make inferences and predictions throughout the reading of the story after each progress report. While reading the text, be prepared to work with the text in a few ways. We set up a few expectations for what needs to be done WHILE we read. 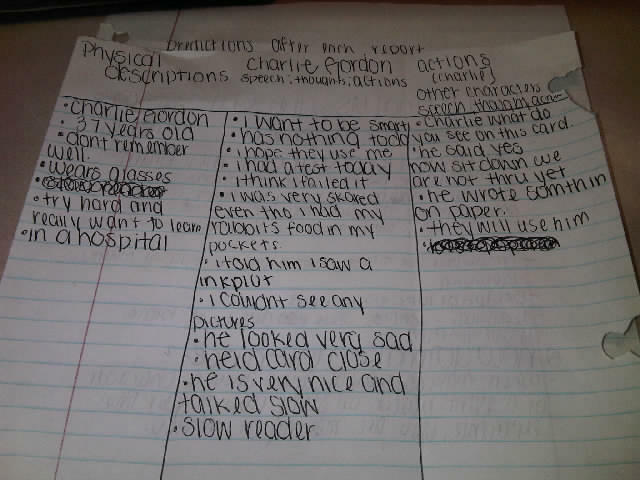 CHARACTERIZATION CHARTS – Set up Characterization Charts for the main character, Charlie Gordon. These will be worked on throughout the reading of the story because just as we change over time so characters change over the course of a story. The charts should reflect changes Charlie undergoes in how he looks, expresses himself, and thinks about himself and others, as well as changes in how he is spoken to, treated and thought of by other characters. 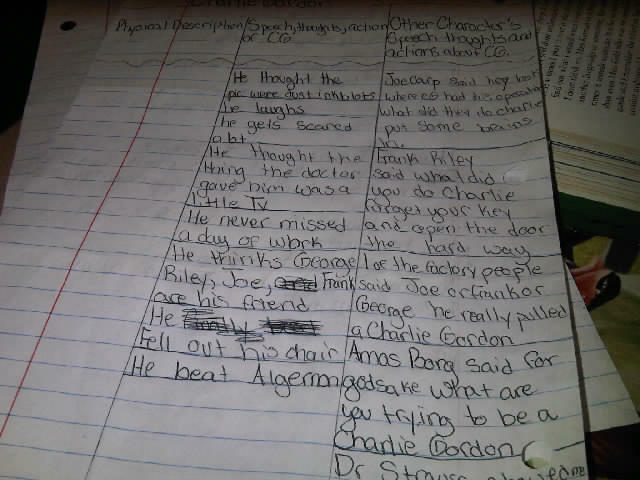 You may record inferences right on your Characterization Chart too. GUIDED READING ACTIVITIES – You will be required to write thorough answers (RAD format) to a detailed Guided Reading Activities Worksheet. 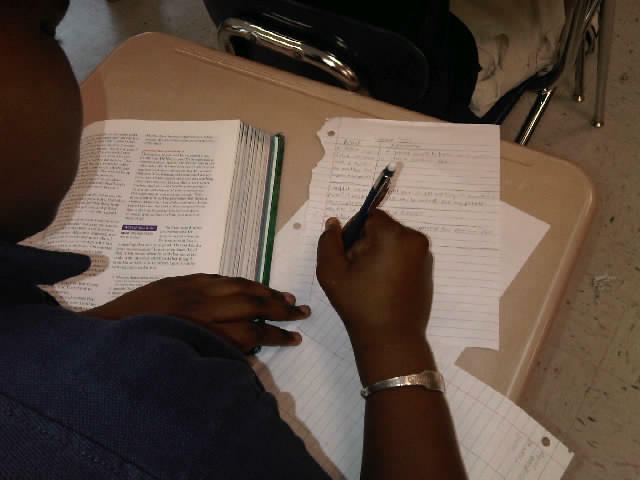 EXPOSITORY ESSAY – Plan & POST – When we are done reading the text, you need to be prepared to write a brief essay on one of these three topics. Students must write an expository essay in response to one of the following questions. What characteristics of Charlie make him a dependable narrator? Think about society’s attitude toward the mentally challenged. How might society treat Charlie throughout the course of the story? Should Charlie have gone through with the surgery? Discuss the pros and cons and come to a conclusion. PERSUASIVE ESSAY – Plan & POST – When we are done reading the text, you need to be prepared to write one persuasive POST for your website. Explain what the quotation means. Explain how the quotation represents the theme of the story. Persuade your reader to agree with your take on your quotation. Follow this link to THE Flowers for Algernon Guided Reading Activities. And now for some student work samples. Mohammed answering an Active Readin.g Question. 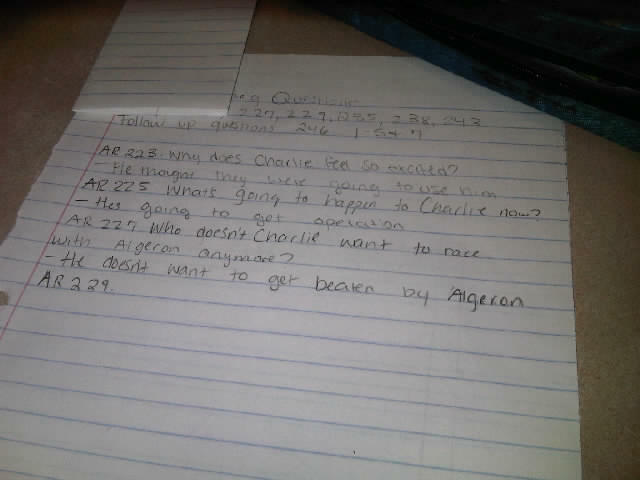 Active Reading answers from a hard working young adult. Predictions after each Progress Report. Here’s the link to the Supplies List – School Year 2010-2011. Predictions after Progress Report 9. 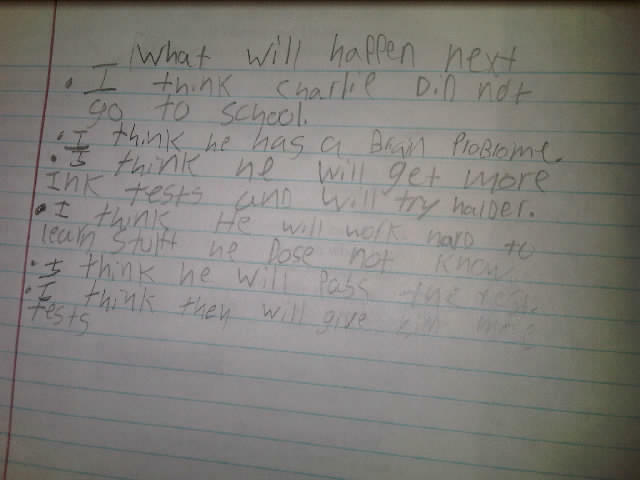 Inferences and/or predictions after Progress Reports. Another Characterization Chart. NICE one. We read the short story, but when we’re done, you may enjoy the AUDIOBOOK. Here it is.